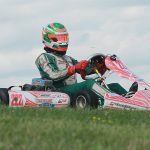 The 2016 United States Pro Kart Series is on the eve of completing the season, putting the seventh round of the championship program into the books Saturday at the Pittsburgh International Race Complex. Rain stayed away from the Wampum, PA facility after an 80% chance of precipitaion was forecasted on the day. A front rolled through a couple hours after the completion of the day’s on-track action, bringing heavy rains and intense wind. The four IAME categories and four Yamaha divisions put in some great racing on the day, highlighted by stellar finish to the Yamaha Pro category. Throughout the day, the fight for the top position in the Comet Racing Engines Yamaha Pro was between Senior rookies Brandon Lemke and Zach Holden. The two split the heat wins with Lemke (Merlin) earning fast time in qualifying to secure the pole position. They were joined by defending champion Mike McAndrews (Fullerton)—making his first class start of 2016—and current championship leader Dakota Pesek (Top Kart). Eventually, Pesek lost the draft to make it a three-driver fight. After jostling for the lead, Holden assumed the spot until the white flag when both Lemke and McAndrews worked around him. Coming to the esses section before the final corner, Lemke and McAndrews went side-by-side. Slight contact was made and they both drifted wide. This opened the door for Holden to slide through, reaching the checkered flag first for his second victory in the class. Lemke finished second with McAndrews third. Pesek dropped back into the grasp of Jake Venberg (Merlin), able to hold him off for fourth. Holden was among the top contenders in the Franklin Motorsports IAME Pro, earning the pole position after a heat win and runner-up result. Holden was able to get away from the field as they raced hard behind him. Lap three, contact at the front of the field changed the contenders with Ryan Norberg (Tony Kart) jumping on top of Brandon Jarsocrak’s Praga machine. Norberg retired as Jarsocrak—who ran up front despite missing Friday practice for school commitments—rejoined at the back of the field. Holden led until lap seven when a charging Austin Garrison (CompKart) took over the position. Braden Eves followed through the next lap as Holden continued to run a little bit off the pace. Garrison showed the way for the remainder of the 20 laps to cross the line first. Officials issued a penalty on Garrison, placing him behind Norberg for the contact on lap three. This awarded the victory to Eves, earning his first victory on the season. 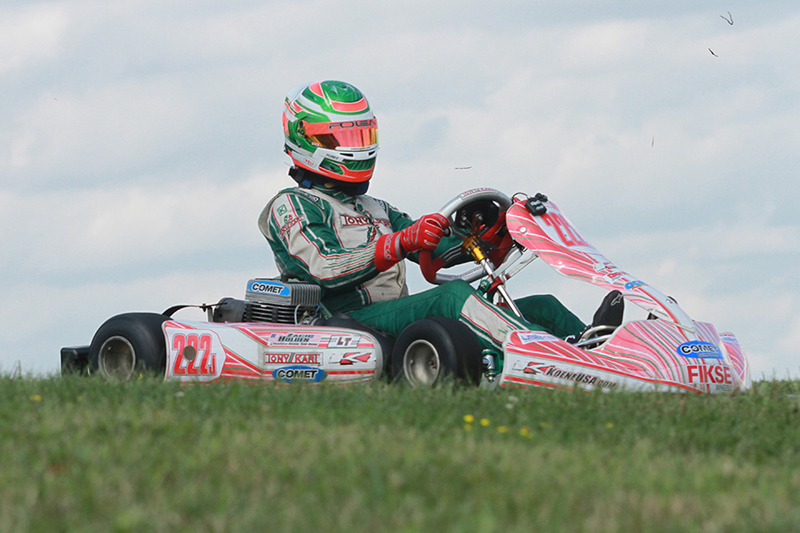 Brandon Lemke (Merlin) placed second, and thus recorded enough points to claim the USPKS championship. Jake Donald (FA Kart) rounded out the podium with Michael Geringer (Merlin) placing fourth in his return after flipping hard in Shawano. Holden dropped down the order, classified fifth suffering from a neck and back injury, barely hanging on to the checkered flag. 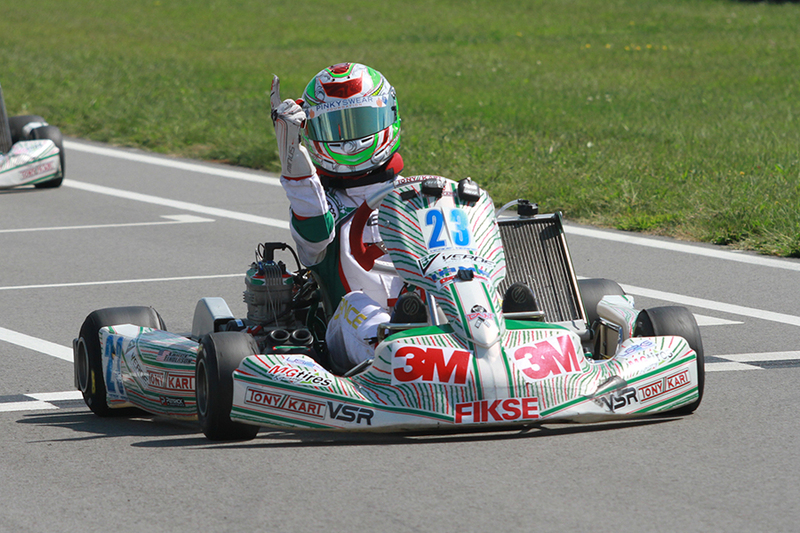 Another amazing finish occurred in the Innovative Performance IAME Junior category. Local driver Tahlon Yockel (Tony Kart) kept pace with the top USPKS regulars, winning the first heat and placing runner-up to Myles Rowe (Tony Kart) in the second moto. That put him on the pole position for the main event, alongside championship leader Sam Mayer (Merlin). Mayer and Yockel led early until the Sam secured the position. It began to be a fight for second with Rowe and Yockel. Eventually, seventh-place starter Lance Fenderson (Tony Kart) was able to run them down late in the race, and a slip up by Mayer opened the door for Lance, jumping from third to first before taking the white flag. Fenderson went unchallenged in the final circuit, securing his second straight victory. Mayer crossed the line in second, but came across the scales a few pounds under the minimum weight, changing the entire complexion of the championship chase. Mayer’s DQ put Rowe to second. Austin Schaff (Merlin) worked by Yockel late with Nicholas d’Orlando (CompKart) rounding out the top-five. The day looked to belong to Aidan Harrington (Kosmic) in the Woltjer Racing Engines Yamaha Junior. The Junior rookie secured fast time in qualifying, backing it up with wins in the heat races. Merlin drivers Austin Schaff and Alex Bertagnoli joined him at the front in the main event. Schaff took over the lead on lap three, with Harrington pacing himself on the rear bumper. Bertagnoli lost the draft late, leaving the top two alone to decide the race. Harrington challenged, but Schaff held strong and fought off the younger driver. At the line, it was Schaff with his first victory in the category. Harrington settled for the second position with Bertagnoli third. Sam Mayer (Merlin) won the fight for fourth ahead of fellow Merlin driver Arie Venberg with James Lynch (Tony Kart) in sixth for his Junior debut. The Allison Racing Engines IAME Cadet class was all Benik with championship leaders Tyler Maxson and Reece Gold at the front. Maxson set the pace in qualifying, driving away to the win in Heat #1. Gold came back to win Heat #2, putting the duo on the front row for the main event. Gold was shuffled back to fifth in the opening corner, as Maxson took advantage to put a gap ahead of the rest of the field. Gold eventually worked into the second spot, posting fast laps of the race, unable to cut into the advantage set by Maxson, who recorded his first victory of the season. 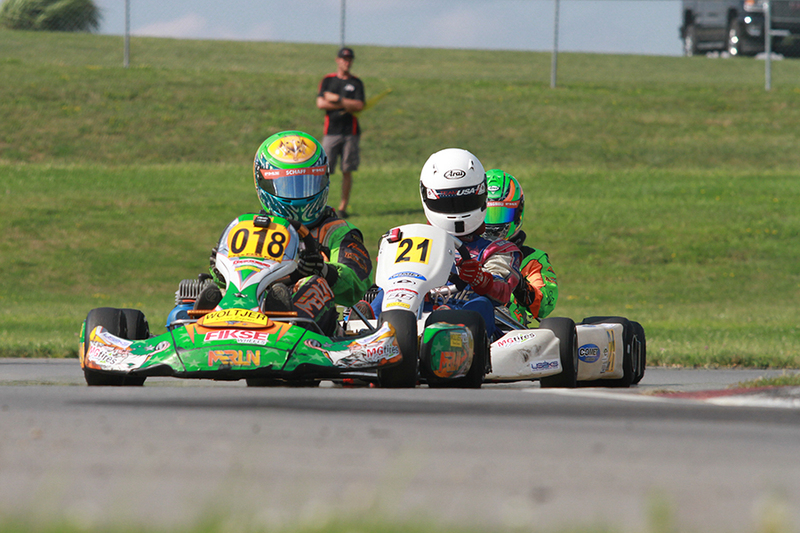 Kaden Wharff (Top Kart) won the battle for third ahead of Connor Zilisch (Tony Kart) and Zane Maloeny (Formula K). 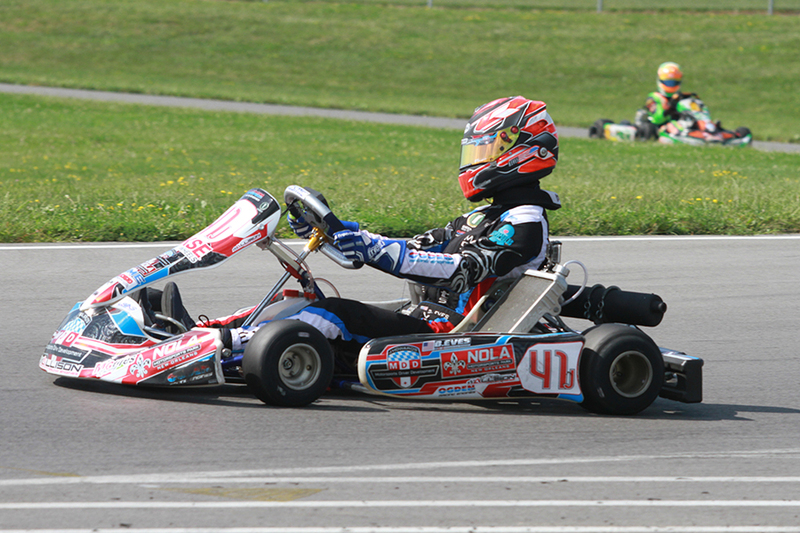 Kaden Wharff (Top Kart) jumped back on the winning side of things in the Switch Racing Engines Yamaha Cadet division. After winning the first four main events, a driving infraction at the end of Round Five main event cost him the result, and the Round Six inclusion. The championship chase is out of reach, but the fight is not over. Wharff swept the day’s action, leading from qualifying to the final circuit. Wharff took the victory after leading all 15 laps, just ahead of championship leader Garrett Adams (FA Kart). Annie Rhule (PCR) recorded her first podium of the season in third, edging out Logan Adams (FA Kart) and Nicholas Terlecki (Merlin). Brent Crews also locked up his championship in the Jay Howard’s MDD IAME Rookie class with a sweep of the Round Seven action. Crews went untouched all day, leading every lap of the two heat races and the 12-lap main event to claim his first USPKS title. Frankie Iadevaia (FA Kart) won a great battle for second ahead of Mateo Rubio-Luengo (Kosmic) with Benjamin Maier (Top Kart) and Paige Crawford (Tony Kart) making up the top-five. Three drivers battled for the victory in the QPS Employment Group Yamaha Rookie division. Elliot Cox (Benik) set fast time in qualifying with Sebastian Ng (Top Kart) and Paige Crawford (Tony Kart) taking the heat wins. Mateo Rubio-Luengo (Kosmic) replaced Ng at the front come main event time, with the trio pulling away from the rest of the field. Crawford led the first half of the race until Cox led for a few, Rubio-Luengo came on late, taking over in the closing laps and holding on to cross the line first for his second win on the year. Cox held on for second, gaining a few points over championship leader Crawford. Ng drove to fourth with Eli Trull (Fullerton) placing fifth.